The four-star Hotel Canal Grande is one of three excellent hotels on the Campo San Simeon Grande (a.k.a. the Campo San Simeon Profeta), which is about five minutes from the railroad station via the Scalzi Bridge. 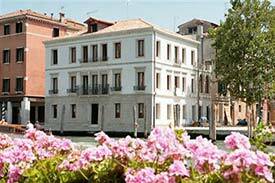 As the name implies, the hotel is directly on the Grand Canal, and so is the adjoining little square. Leave the station by the front steps, or by the easy-to-miss (and stair-free) side exit if you have rolling luggage, a stroller, or a wheelchair. Turn left and walk a few meters to the Scalzi Bridge, which arches over the Grand Canal just to the left of the station. Cross the Scalzi Bridge and continue straight ahead, past the Burger King and down a narrow street. Continue to the low bridge up ahead, cross it, and walk to the church of San Simeone Profeta. Bear left and continue around the church. You'll enter a short arcaded passage that leads into the Campo San Simeon Grande. The Hotel Canal Grande is on the right side of the square, next to the water. Head for the tree-lined side of the Piazzale Roma. Look for a pedestrian path between two rows of news, food, and souvenir stalls. Walk straight ahead to the low stone bridge. Walk along the fondamenta (the sidewalk by the canal), which will curve and lead you past the park to another canal with a small bridge. Cross the small bridge and keep walking until you reach the Burger King. Turn right and follow directions 3 to 6 in our railroad-station directions above. Note: Alternatively, you can cross the Calatrava Bridge (Ponte della Costituzione) from the Piazzale Roma, walk a few meters to the train station, and follow our directions from the railroad station. We suggest following the directions above instead, because the Scalzi Bridge by the train station is higher and has more steps than the low bridges on our recommended route. Follow the directions from the Piazzale Roma above.